Best Way to Watch iTunes Rental Movies on Airplane without Internet? For many people, flying is common, and for some of us, it is even a necessity. But one thing never seems to change—how to spend all those long, boring hours on the plane. You can only eat so many peanuts and listen to so many people snoring. Or you can choose from the small selection of in-flight movies, but if you prefer to rent an iTunes movie for watching on an airplane, or somewhere out in the wilderness away from cellular towers, you can download them locally to your device prior to the day of your trip. When you rent a movie on your iOS device from the iTunes Store it goes directly to the cloud. You need to download the entire movie to your iPad or iPhone in order to watch it on the plane in offline mode. However, for iTunes rentals, you only have 30 days from the time of rental to watch the movie, and once you start watching the movie, you have 48 hours to finish watching it. Is there a better way to enjoy iTunes rentals on Airplane offline without limitation? You bet. In order to free yourself from the iTunes rentals restrictions (such as last iTunes rental period and play iTunes rentals on various devices) , it will be necessary to remove DRM protection from iTunes rentals. M4VGear DRM Media Converter is an outstanding program worthy of try. 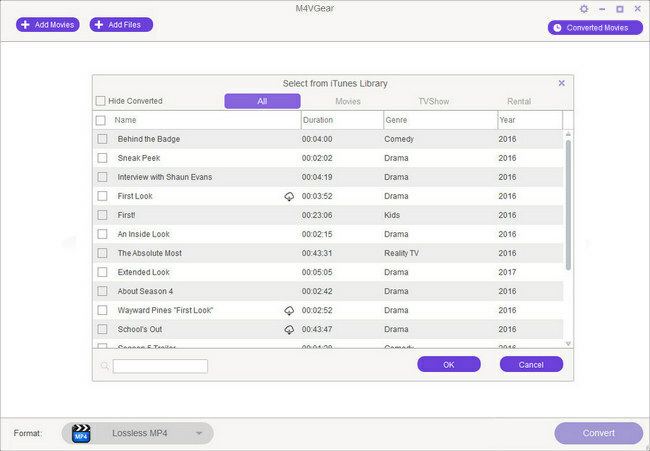 As M4VGear can losslessly remove DRM from iTunes movies and convert them to MP4, MOV, MP3 ... at up to 20X fast speed, as well as keeping all subtitles and audio tracks. In the following guide, we would show you how to convert iTunes M4V videos to MP4 for playing without any limitation. Tutorial: How to Convert iTunes Movie to MP4 for Playing Offline? 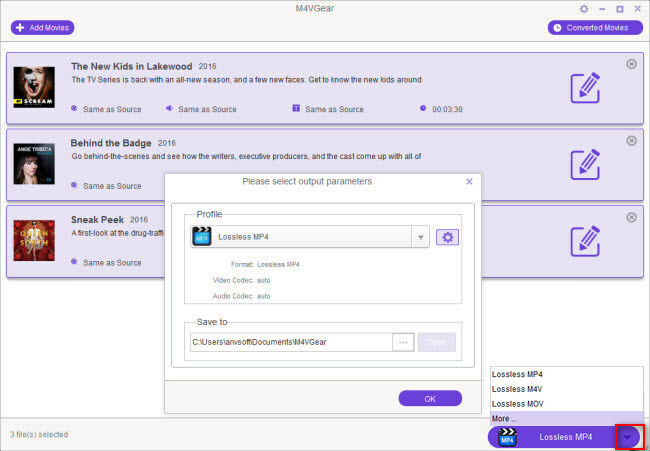 Launch M4VGear, click "Add Movies" button on the upper left or on the center of the interface. A pop-up window would display all your iTunes purchases and rentals, including movies, TV shows and music videos. Note: There is a more efficiently way to import the file, which is directly drag and drop videos into M4VGear. Select the output profile formats from the button. M4VGear supports batch conversion after choosing different output profile for each video file. Output format as "Lossless MP4" is highly recommended, which enables users convert movies at up to 20 times faster speed while keeping Dolby 5.1 audio track and all subtitles. Tip: If you need to change the output format or output directory, you can click the small icon next to "Lossless MP4" to change the output format. There are various output format for you to choose from. Click output profile button to begin converting iTunes M4V movies to DRM-free MP4 format. After conversion, you can find the well-converted files by clicking the "Converted Movies" button. Then, you can directly play these video on your local HD player or transfer them from your computer to your Tablet or smartphone for watching freely even when you don’t have an internet connection. Note: M4VGear allows you to convert 1 minute of iTunes M4V videos for free. You can purchase the full version of M4VGear iTunes M4V to MP4 Converter with limited-time price $44.95 ($49.95) to remove the time restriction Now. How to Keep iTunes Rentals Forever on Computer or iPad/iPhone/iPod? How to Stream iTunes Purchased and Rented Movies on iPhone 8 (Plus)? How to Play iTunes M4V Videos on Surface Pro 4?